MS Viikki, the frst LNG-fueled bulk carrier. A permanent magnet machine at the heart of this solution generates energy to match shipping’s push for less waste and increased effciency. Increased effciency via variable frequency drive technologies in shaft generator systems. One ship, MS Viikki, incorporates winter ice coverage, and protected, as manent magnet shaft generator. the operating hours of the auxiliary gen- some innovative hybrid propulsion a sulfur emission control area (SECA). WE Tech Solution Three which is erators – saving fuel and resulting emis- technology that could change the con- MS Viikki and sister ship MS Haaga are implemented on these vessels compris- sions – as well as reducing maintenance versation. MS Viikki, the world’s frst both designed in accordance with the es Economical Operations (PTO) and requirements. 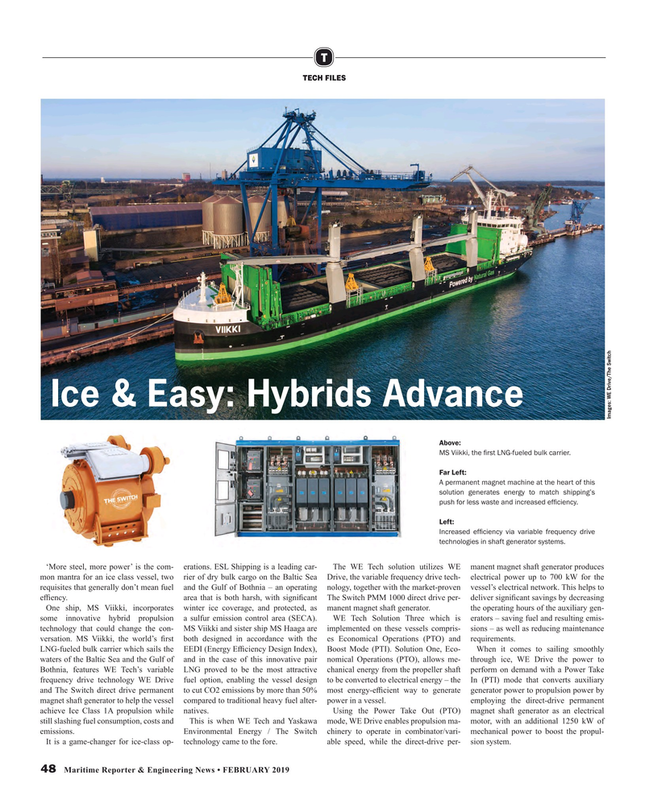 It is a game-changer for ice-class op- technology came to the fore. able speed, while the direct-drive per- sion system.